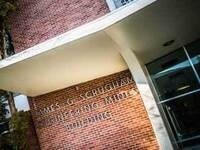 Opened in 1963, the Scrugham Engineering and Mines Building vastly expanded the University’s laboratories, faculty offices and student classrooms in the College of Engineering. Named in honor of James Scrugham, a dean of the College of Engineering, Governor of Nevada, U.S. House of Representatives member and State Engineer, the building is home to the Departments of Civil Engineering, Computer Science, Environmental Engineering, Electrical Engineering, the Engineering Advisement Center and the Nevada Bureau of Mines and Geology and state geological survey. As a liberal arts person, it was very interesting for me though parts were over my head. I appreciate the Q&A.